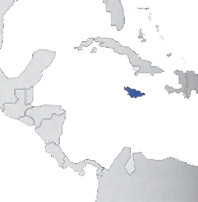 The state is constituted by one of the 4 islands of the Great Antilles (the other ones are Cuba, Hispaniola and Puerto Rico), located to south of Cuba and to west of Haiti. It has a surface of 10.000 Kmqs (less than half Sardinia), but the landscape is extremely various and very beautiful, with its coasts hemmed of palms and bathed by a transparent sea, from the rivers rich in waters, to the luxuriant bananetis, up to the Blue Montains (mt 2.256 msl). Sometimes the population can be aggressive (Kingston is a dangerous city), but the sea is fantastic and the hotel structures are of first-rate.